A father who fought a long-running legal battle after taking his daughter on a term-time holiday to Disney World Florida has been found guilty over the unauthorised trip. Jon Platt was convicted of failing to secure his child's regular attendance. He lost an earlier legal challenge at the Supreme Court in April, despite winning previous legal battles in a case brought by Isle of Wight Council. 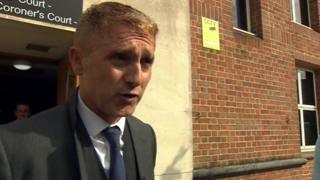 Platt was given a 12-month conditional discharge and ordered to pay £2,000. The case - over a £120 fine - returned to Isle of Wight Magistrates' Court earlier where Paul Greatorex QC, for Platt, had argued the prosecution should not continue and was an "abuse of process". He suggested none of the documents published by the council or the primary school on attendance made it clear when a penalty notice would be given. "It's completely vague, it does not give the guidance that parents are entitled to expect," he said. Mr Platt told the court he did not believe he had seen a number of documents from the school setting out changes to absence rules. He said a form from the school, when he applied for the seven-day absence in 2015, had noted that attendance of between 90% and 95% was satisfactory, which his child fell into. Fined: 11,493, average fine £176. But Ben Rich, counsel for Isle of Wight Council, said giving clear guidance did not mean spelling out every consequence of any action. He argued the school was not required to make sure that every letter sent home was read, and that the council's code of conduct had made it clear that a penalty notice could be issued for a term-time holiday. Giving the judgment, magistrate Jeannie Walker said: "The circumstances of this case fall squarely into that breach of school rules." The case has cost taxpayers £140,000. Speaking after the hearing Mr Platt said he was "disappointed" by the verdict. "I didn't want to lose but there's a part of me that is actually relieved. "If we'd won today, it seems pretty clear the Isle of Wight Council on the abuse of process argument may well have sought to appeal to the High Court and I desperately needed this all to be over."